Jenova Chen, designer of the video game Journey by Thatgamecompany, said in a recent interview on designerzord that he believes there are two types of people in the world when it comes to approaching games. It’s a great mindset that I hope to bring in my future tabletop RPG endeavours, especially with my adventure campaign for Numenera whose creator Monte Cook I think has similar goals as Chen. Creating something totally different than what’s been done before, trying new things and finding new places. His recent work is Journey, which is about a robed figure making his way through a desert and traveling through ruins of what appears to be a once technological empire. In fact, Journey would easily fit in Cook’s Ninth World of Numenera where the denizens live on earth a billion years in the future discovering artifacts of great civilizations that have fallen. Journey’s many memorable locations are beautifully rendered, and the game gets even more immersive when you are joined by another player, whose name is not shown and communication can only be done by musical notes. 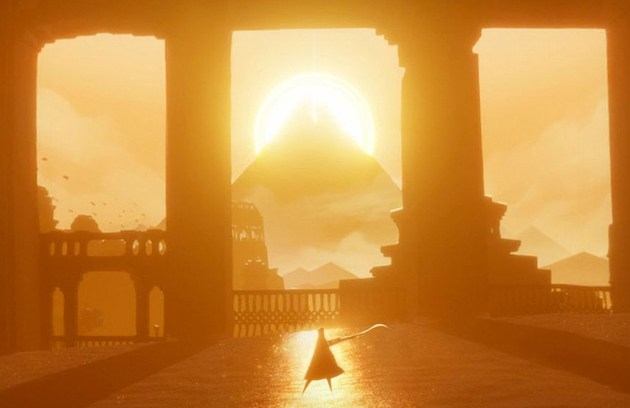 My only complaint with the game is that it’s too short, however in Journey it’s not really about the end but how you got there.